On 23rd January 2016, the then Chancellor of the UK Exchequer (finance minister) George Osborne announced (via twitter) that he had negotiated a tax settlement with Google. On examination we decided that this deal was shockingly poor value for UK taxpayers and, worse, almost certainly contravened European Union rules on illicit state aid. On 28th January 2016 we wrote (see the full text of our letter below) to the European Commission expressing our concerns and calling for a comprehensive review not just of the Google settlement, but of ALL tax deals struck by the UK government with multinational companies. 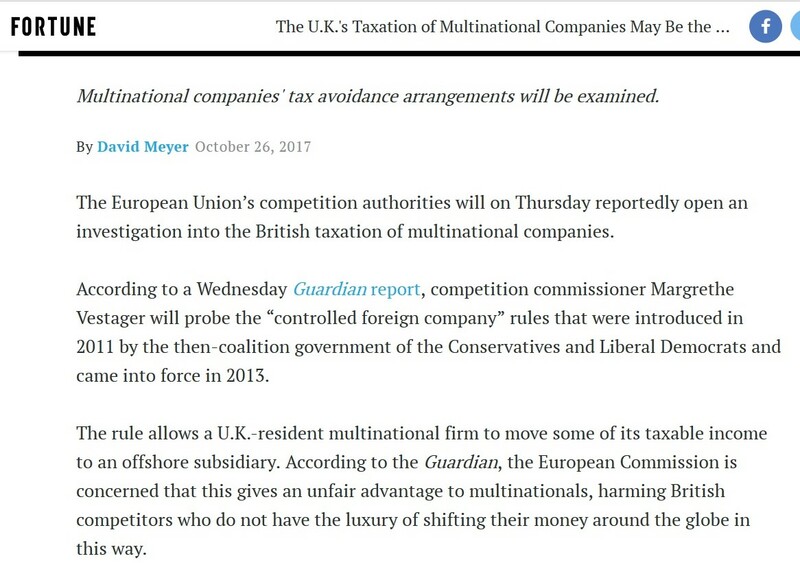 The international press are now reporting that the EU’s competition authority now plans to investigate the UK controlled foreign corporation (CFC) rules introduced by George Osborne in 2013, which will have enabled significant profits shifting to offshore based CFCs. TJN welcomes this announcement, and calls for significant strengthening of EU rules on national tax treatment of MNCs, which in most if not all cases causes market distortions that benefit businesses at the expense of other taxpayers and consumers. Politicians throughout Europe (and elsewhere) are labouring under the impression that giving tax breaks to businesses will improve “competititiveness”. It does no such thing. The evidence of the past decade shows clearly how tax cuts and breaks do not encourage investment; quite the opposite. But there seems little room for doubt that tax breaks to Capital will increase inequality and fuel social discontent, sowing the seeds for the extremism and separatism that is currently tearing European democracies apart. We are writing to you to request that the European Commission initiates an investigation into administrative measures taken by the UK government to selectively lower the tax rate of companies operating within its jurisdiction. We call on the European Commission to investigate in particular the deal over past tax liability with Google as announced by the UK Chancellor of the Exchequer. We further call on the Commission to investigate the scope and extent of any other such deals with companies operating in the UK and the lawfulness of any such deals. We believe that the deal announced by the UK Chancellor could constitute unlawful state aid under the terms of the EC Treaty. We further believe that other such deals, which would also give rise to the same concerns may also have been concluded by the UK Government. On January 23rd the UK Chancellor George Osborne announced via a tweet from Davos that the UK Government had reached a ‘deal’ over its past tax liability. It is impossible to say for certain how the company managed to achieve such a substantial discount on the standard rate of tax, as the details of the deal remain confidential. However, it is our understanding that the UK government may have selectively applied (or failed to apply) the rules on permanent establishment. The fact that the deal was only disclosed at the request of the company, suggests that the UK government may have concluded an unknown number of similar deals with other companies. These deals are by their nature done on an ad-hoc basis and are not available generally to companies in the UK. Article 87 (ex 92) of the EC Treaty prohibits state aid that threatens to distort the European Single Market. In summary the actions taken by the member state, in order to be considered state aid, must be specific or selective rather than general in nature. In addition the measure is not required to be a direct subsidy, the state forgoing potential revenue that is due to it is considered to be equivalent to the consumption of state resources. The beneficiary of the aid must be an economic actor within the community that acts in competition with other economic actors. It is the view of the Tax Justice Network that the ‘deal’ announced in the UK Chancellor of the Exchequer’s tweet demonstrates that the UK may have adopted a harmful tax practice under the terms of the Code of Conduct, and the selective application of this is contrary to the TEC. These tax practices are not only harmful to trade within the European Union, but also harmful to the British public, who have had to suffer severe cuts to public services on the basis that the government has not been able to raise sufficient revenues to fund those services. It is our belief that the nature of deal announced by the Chancellor suggests that similar deals may have already been reached between the government and other, unknown companies, or may be in the process of being negotiated. The treaties and past decisions of the European Commission place an obligation on the Commission to act and to start an investigation on both the deal announced with Google, and any other deals of a similar nature that have been concluded or are in the process of negotiation.